According to research conducted in 2015, an estimated 2.1 million Hindus living in the United States celebrate the Festival of Lights each year. If you’re new to life in the U.S. or you just want a new way to celebrate Diwali, here are some ways you can share in the spirit of this sacred holiday. Hindu temples and cultural centers often host events with Diwali food, costumes, music, and dancing. Larger Diwali festivals are also organized in cities across America. Check out this list of Diwali celebrations in the US to find one near you. Diwali isn’t a national holiday in America so gatherings and festivities generally take place on the weekends before and after the holiday when it falls on a week day. Celebrating Diwali with a wide-ranging group of people, including friends and coworkers, is a point of pride for many Indian Americans. Commonly referred to as "Indian Christmas", the Hindu New Year is a great opportunity to spread awareness about Diwali traditions while you connect to your own culture and spirituality. Show off the holiday with colorful lights and rangoli, candles and, if possible, sparklers and fireworks. If you have guests, you can print the lyrics for some popular sing-alongs and demonstrate your best Diwali dance moves. Another great way to share Diwali tradition is with an authentic "puja potluck", complete with tikka, curry, biryani, roti, poori, paneer, and plenty of desserts. For something more low-key, you can simply share traditional Indian sweets and Chai tea. 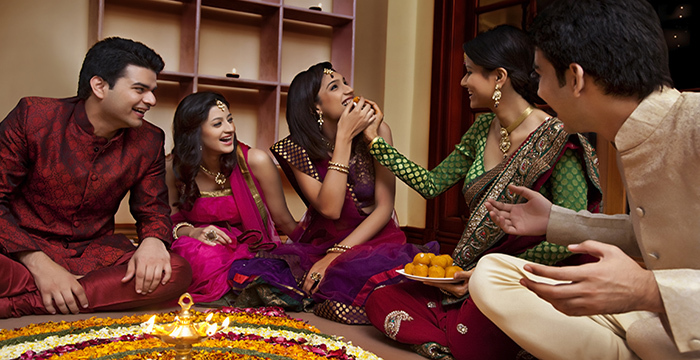 Diwali is an important time to connect with loved ones back home. Along with calling friends and family, exchanging gifts will make Diwali in America feel more like it does at home. Traditional gifts, like Lakshmi Ganesh coins, religious idols, and dry fruits convey respect, good wishes, love, and appreciation for the recipient. They also symbolize a hope for prosperity. If you can’t be there to exchange in person, you can send money to India or elsewhere around the world.